Citronella essential oil has a powerfully sweet and lemony aroma, with a herbaceous undertone. Citronella essential oil is commonly used as an insect repellent. It is also antibacterial and deodorising. The citronella grass is dried first and then steam distilled. The drying stage is important because it gives the essential oil the more favourable aroma. Citronella oil blends well with lemon, bergamot, orange, cedarwood and geranium. When blended with neroli or bergamot it is particularly softening to the skin. 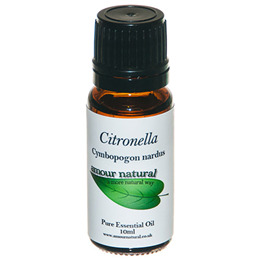 Below are reviews of Amour Natural Citronella Pure Essential Oil - 10ml by bodykind customers. If you have tried this product we'd love to hear what you think so please leave a review.